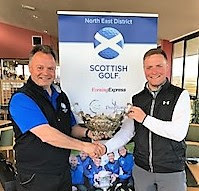 Newmachar's Chris Lamb outstripped the field field with a pair of 69s to win today's North-east District Phillips Trophy at Newburgh by a six-stroke margin with a six-under-par total of 138. Chris Gilbert (Cruden Bay) was runner up with two 72s for a par total of 144. Chris (right) is pictured receiving the trophy from his father Robert, vice-president of the North-east District of Scottish Golf.